I know these don’t look the best in the photos but trust me on this one…these. are. so. good. Like, melt in your mouth, extra double chocolately good. They went way, way, way to fast at my house. I should probably hold off on a second batch but I don’t know if I can resist. The weekend is here and there may be more double chocolate protein cookies in my very near future. They’re smooth, decadent and high in protein and fibre thanks to….you’ll never guess it….beans! Yes, beans in cookies. It’s true! Just look at that ingredient list, it’s so simple! I hope you enjoy these decadent but healthy little treats! They’re a perfect after dinner fix or mid-day snack, just try not to eat them all in one weekend like we did. Enjoy! Place all ingredients except chocolate chips in a blender or food processor and mix until smooth. Place in a bowl and stir in the chocolate chips. Drop by tablespoonfuls onto a cookie sheet and press each cookie down slightly with your fingers. Bake for 17 minutes, remove and let cool on the pan before handling. They will seem under done when you take them out, let them cool completely and they’ll firm right up. I didn’t take much care to press these into beautiful, consistently round little cookies. If you’d prefer a more uniform cookie, roll them into balls and press down with a fork before baking. Recipe adapted from POWER HUNGRY: The Ultimate Energy Bar Cookbook. Carrob chips also work great in place of chocolate chips! These have been a staple at ours for a couple years. Sinfully delicious. 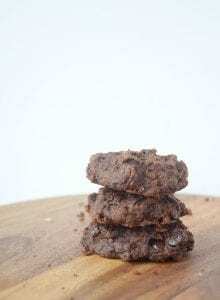 Yes, carob chips would also work great!! Yummmm! SOOOOO good! I still have never made any desserts with beans! I have no idea what I’m waiting for! I think the photos for these look absolutely AMAZING and I love the secret ingredient! I might need to try a batch of these over the weekend ;). Chocolate addicts unite! They look fantastic in the photos! I’m all about healthy snacks lately – I love the idea of beans in cookies! These look great! 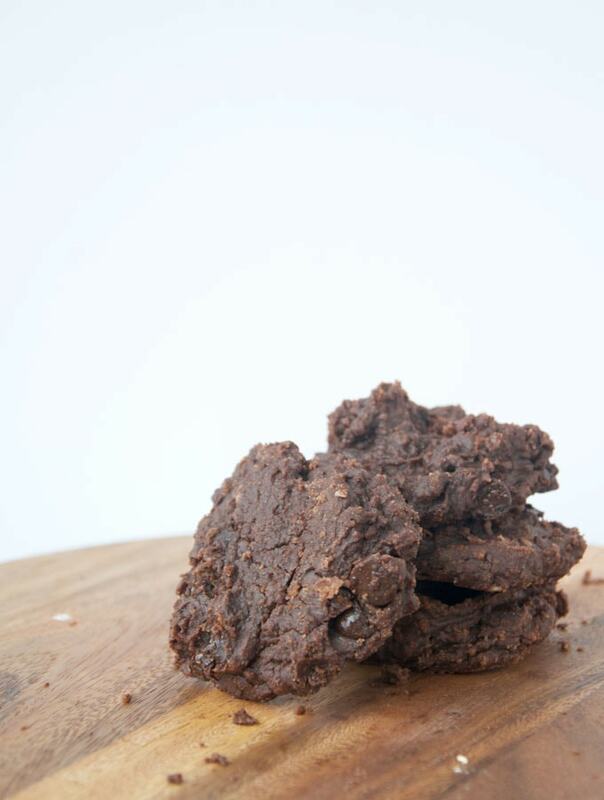 We must be in sync, maybe its the weather, I just whipped up some healthy whole food chocolate cookies last night. Love guilt free treats! I’ve never tried beans in cookies, I will have to give these a go! The cookies look great. I was curious if you can taste the peanut butter in this recipe? I would love to try for my daughters, but they don’t care for peanut butter. Chocolate definitely! You can’t really taste the peanut butter but you could always sub almond or cashew butter if you prefer! YES! Anything with the words “double chocolate” in it is a win! And I don’t care if they don’t look perfect and round – they look delicious!